Is something in the air? Do I detect a change in consensus on the way things are going in Japan? Certainly a slew of articles have been published in the financial press over the last month questioning where the Abenomics experiment is headed for. The general conclusion seems to be that wherever it is it is certainly not the originally designated endpoint. Thus the Economist. 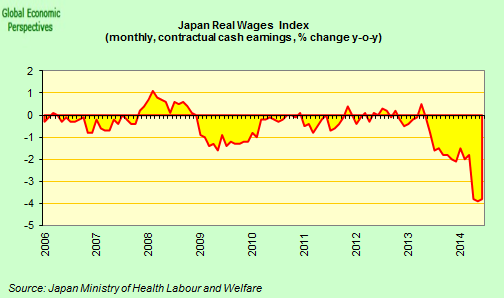 Japanese wages do not seem to be responding to normal market pressures. Why not? The conundrum has its roots in the altered structure of the labour market. Contrary to common perception, Japan has an exceptionally flexible workforce. Outside the ranks of the protected “job-for-lifers” – a much rarer breed these days – nearly 40 per cent of workers are about as flexible as you get. They work in poorly paid jobs for hourly rates. Benefits are all but non-existent. For most of these workers, sometimes referred to as the “precariat”, unemployment is a mere “sayonara” away……. For its reflationary experiment to work, wages must begin to rise in line with inflation. But the casualisation of the labour force is short-circuiting that process. Moreover, people in the precariat are less likely to marry and have children. If Japan is to solve its demographic problem, it will have to tackle the labour issue. Mr. Abe took office in December 2012 and quickly engineered an upturn in growth that was dubbed Abenomics. Mr. Abe’s policies were backed by the monetary “bazooka” of Bank of Japan Gov. Haruhiko Kuroda, who started flooding the economy with more cash in April 2013. Though economists warned that the recovery was still fragile, Mr. Abe decided to increase taxes, hoping to reduce Japan’s massive debt load. 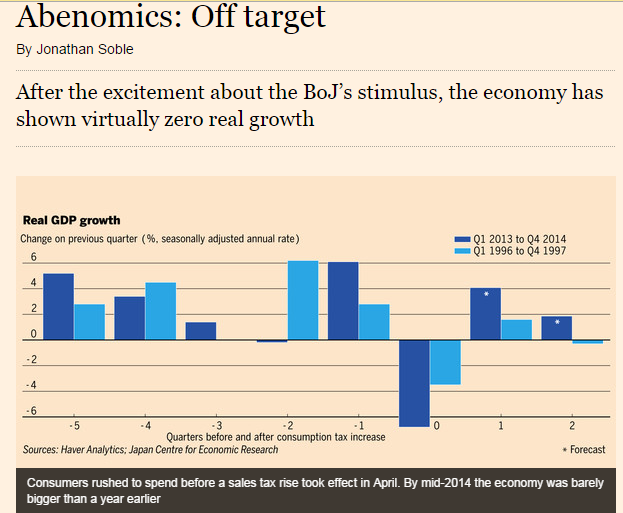 On Friday, top government officials stuck by their view that Abenomics remains on track. Officials described the downturn in consumer spending as temporary, suggesting it had been exacerbated by rainy summer weather in parts of western Japan. Or Stanley White at Reuters (Export recovery proves elusive for hollowed-out Japan) who focuses on the fact that, despite the sharp yen devaluation, exports have hardly improved. Mazda Motor Corp has returned to profit as the falling yen has rewarded the carmaker’s export-heavy strategy. Mazda’s response? Move some production to Mexico. Investing in plant abroad is hardly an endorsement for Prime Minister Shinzo Abe’s strategy to revive the fortunes of the world’s third largest economy, and one driven by exports. “Companies are not that interested in expanding capacity in Japan,” said Kaori Yamato, senior economist at Mizuho Research Institute. “This is a problem for exports.” With companies making less goods at home, it has become structurally difficult for exports to rise, even with the yen at multi-year lows as a result of Abe’s policies, economists say. In fact White’s conclusions seem especially pessimistic. “Economists say the lost production may never come back,” he tells us, and he could be right. i) Unemployment is down, but an excessively flexible labour market means that wages keep falling. ii) Inflation is rising (partial success) but living standards are falling. iii) Beyond inflation Abenomics doesn’t have clearly defined priorities and fiscal policy continually falls between the two stools of stimulating the economy and reducing the debt: you can’t eat your cake and have it. iv) Times have changed in Japan, the workforce is ageing and to some extent the decline of the export industries may be becoming unstoppable. Curiously despite the meager harvest the “put on a brave face” brigade are still out there, and even managed to not feel ridiculous putting up headlines like “Japan Wages Make Biggest Jump in 17 Years” which is true, but leaves out the inconvenient little detail that inflation is rising at a rate which takes us back even further in time. (See my Japan inflation at a 32 year high). Indeed you have to work your way through to the end of the WSJ article todiscover that “the increase in earnings, however, was negative after accounting for inflation”. One of the problems external observers have in following Japan is that there are a variety of ways in which wages and salaries are measured and the headline number can vary according to which measure you take. One of the most popular ones is worker household income (published monthly by the statistics office). According to this indicator household income even fell in nominal terms in July (-2.4% see below), and was of course way down in real terms (-6.2%). The WSJ journalist chose to cite the preliminary monthly report from the Ministry of Health, Labor and Welfare, which showed average total cash earnings (including bonuses and special payments) rose by 2.6%.in July over a year earlier. Average contractual cash earnings, on the other hand, were up just 0.9%. In both cases you have to subtract the 3.3% annual inflation to find the full impact on wages and earnings. In fact the Health, Labor and Welfare ministry also publish a real wages index which is included as part of the same report. This initially showed basic real wages fell by 3% year on year in July. At the end of the day whichever indicator you choose the result has one common thread – it is always negative. (And indeed these preliminary numbers were revised down on Sept 18. Contractual cash earnings went from a 0.9% to a 0.5% non inflation adjusted rise, and real basic wages went from -3% to -3.4%, so there you go). Then there is the question of whether Japanese inflation is not simply the result of the strong yen devaluation plus the tax increase (I have gone into this at some length here and here). Certainly real doubts exist about the sustainability of the current inflation given the lack of final demand to drive it. Economists Tsutomu Watanabe and Kota Watanabe at Tokyo University maintain a daily price index based on point of sale scanned price data. The index only covers 17 percent of the official Japan CPI in terms of consumption weight, but gives an indication of the trend in frequently purchased items – you can find a list of items covered by the index here. Certainly – if you look at the chart below its hard to see any clear inflationary push over the last six months, au contraire. (Click on image for better viewing). Perhaps the most evident flaw in the Abenomics story is to be found in the export department. The sharp yen devaluation was supposed to lead to a sharp boost in exports which would then drive the economy. And for a time it did. 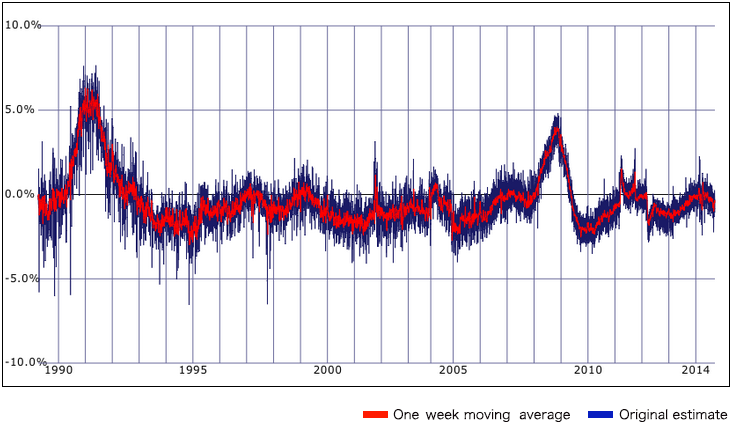 But then, as Reuters Stanley White points out, the export drive simply ground into the dust, and Japanese exports have been moving sideways since the spring (see chart above). This should be pretty worrying for Abenomics theorists, since the stagnation in exports can’t be put down to the tax hike. Where we go from here is anyone’s guess. The economy is surely going to have a brush with recession this quarter, and in any event it is hard to speak about a recovery in anything except inflation and the stock market. Consensus economists are now expecting Bank of Japan governor Kuroda to go for another round of quantitative easing – to force the yen down yet one more time. But why should what didn’t work once do any better the second time round? And anyway, Hurhiko Kuroda himself seems to be trying to talk down expectations in this regard. “Japan’s economy has been on a path suggesting that the price stability target of 2 percent will be achieved as expected,” he told business executives in Osaka last week, adding that “exchange-rate stability is extremely important”. This suggests he is not contemplating any further sharp devaluation. Any yen weakening we will see is likely be contained and not pronounced. On the other hand the administration still has to decide whether to go ahead with next year’s additional tax hike. The government is caught in a double bind, since if it doesn’t raise the consumption tax as planned and cuts spending to compensate then the economy will still contract. And if it doesn’t do either of these things then the debt level will continue its march upwards. At the moment the government is mulling the idea of raising the tax and doing a 5 trillion yen ($47 billion) additional stimulus to compensate. Which sort of leaves me wondering why they want to raise the tax in the first place. What makes people like me nervous is the thought that if the central bank can’t deliver on its promise to deliver inflation and revive the economy, or if the Japanese voters decide they have had enough of the experiment, then a loss of confidence might ensue, and all those dubious risky asset positions might unwind suddenly, just like an earlier set did in 2008. Simple logic you would have thought, but logic in the face of irrational exuberance scarcely stops people in their tracks. As far as I can see, all of this points to one simple and evident conclusion: that Japan needs deep seated cultural changes, especially ones directed to greater female empowerment and more open-ness towards immigration. Hardly matters for central bank initiatives, and indeed ones for which Shinzo Abe, who naturally has given his name to this new economic trend, is singularly ill equipped to carry through. Japan needs a series of structural reforms – like those under discussion around the third arrow – but these would be to soften the blow of workforce and population decline, not an attempt to run away from it. Monetary policy has its limits. As Martin Wolf so aptly put it, “you can’t print babies”. 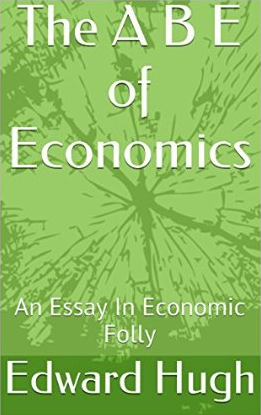 The above analysis is based on arguments fleshed out in much more detail in my “mini book” the A B E of Economics. The book is available with Amazon as an e-book. It can be found here.